Here we are, with the passing of April and the completion of BC Arts and Culture week. Well, the Oliver Art Gallery is proud to push on with the theme by announcing its new Feature Artist for the month of May. 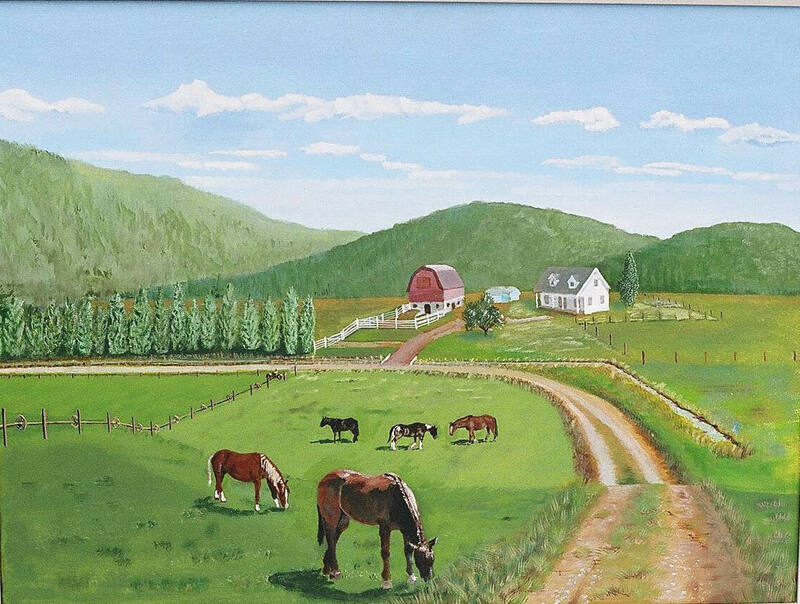 Rod Gould, Horse Logger/Painter will be displaying his many works on our feature walls, from April 30, to May 28th. Rod, an avid outdoors man, has spent most of his life hunting, fishing, farming and logging with his horses on his 1500 acre wilderness ranch. While he had painted and followed his love of art all along, lately he is finding himself out in the weather slapping paint on canvas more and more. His paintings are his attempt in expressing his appreciation, of the life he has had the privilege of living and to pay tribute to some of the good and honest horses he has worked with. His paintings speak, of the sparkle of first light on a mountain river, or times past when horses broke the ground and skidded the logs. Rod occasionally works in watercolour, but mainly he paints in oil. It is the chosen medium of his artistic heroes, like Tom Thomson, Carl Rungius and N.C. Wyeth. He spends a lot of his time painting outdoors, or creating plein air sketches that later become a large studio painting. The Oliver Art Gallery is privileged to have Rod Gould as one of its 20 artists, displaying a variety of mediums and styles from realism to abstract, for the pleasure of all comers. Ceramics and jewelry have also been added as extra variety for a diversity of choice to shoppers. Sunday Mornings, – 9:00 – 11:00AM. Six weeks, starting Sunday May 5, through to June 9th. Every artist needs to be able to draw before they can paint. Learn the basic drawing techniques, for landscapes, animals and the human body. Six weeks, Starting Monday, May 6 through June 10. This will be a teaching Class for beginners. You will learn about the supplies, products and techniques. If you wondered if you had it in you to become a painter, this is where you will find out. A list of supplies will be available upon registration. Two weeks, starting May 13 and 20th. This will be a two session lesson, where you will be able to draw a portrait of your choice. Bring your own photograph to work from. (Picture should be clear and show all features, like the eyes). Drop in to view, Rod Gould’s Art, and the many other beautiful pieces on display.